YASARA can accelerate molecular dynamics simulations using GPUs from AMD, nVIDIA and Intel, in Linux and Windows (MacOS currently crashes, the problem has been reported to Apple). The actual performance is shown on the benchmark page, including article references. The CPU's power is not wasted by letting it run idle, especially since some tasks are better handled by the CPU (the GPU architecture is quite different). Macros that interact with the simulation (steered MD etc.) work unchanged. The only real disadvantage is that you cannot upgrade an old computer by inserting a top graphics card. Instead, the power of the CPU must match the GPU - but having a fast CPU for everyday work is not really a disadvantage at all. To keep the GPU busy, a fast CPU is required. Depending on your budget, we recommend the Intel Core i7 7700K, 8700K (socket 1151), 7820X, 7900X or 7940X (socket 2066) (ordered from slowest to fastest). The processors are unlocked, you can easily clock them higher in the BIOS. Intel's giant Xeons with huge caches and up to 20 cores are less attractive, because they combine a significantly higher price tag with a low clock frequency, that is even throttled further down when using high performance AVX code (like YASARA does). AMD has recently released the new Ryzen CPUs, which offer great value for money, but don't reach the performance of Intel CPUs yet, because they have only half the resources for AVX code. This will change with Ryzen Zen 2 CPUs to be released in 2019. Also note that the more threads a CPU can execute, the larger the simulated system must be. The very small DHFR benchmark with 23786 atoms can keep 16 threads busy. YASARA uses the industry standard 'open compute language' (OpenCL) to communicate with the GPU. OpenCL is supported by all major GPU vendors, so by using OpenCL, YASARA promotes competition and makes sure that you are not tied to a single company, who can then ask arbitrary prices for their hardware. For standard 4-core CPUs (e.g. Core i7 47XX) the AMD Radeon R9-290X/R9-390X/RX580 is a good match, e.g. the Saphire TriX. For fast 4-core CPUs (e.g. Core i7 6700K) you need a faster GPU like the AMD Radeon R9 Fury. Unfortunately this card is still rather expensive, so the equally fast Geforce GTX 970 is a better buy. For extremely fast 6-core to 10-core CPUs (e.g. Core i7 5960X, 6900K or 6950X) you need an equally fast GPU, and this area is currently dominated by nVIDIA. 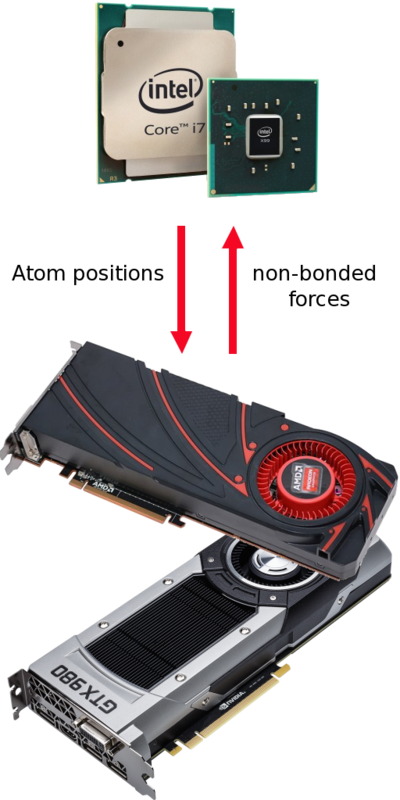 Depending on your budget, choose a GTX 980, GTX 980Ti, GTX 1070, GTX 1080, GTX 1080Ti or any newer and faster card (this page is not updated with each graphics card release). If you are running Linux, AMD's drivers are known to cause more problems during installation. On some combinations of APUs and Linux distributions (e.g. AMD A10 7850K in Fedora 20) we even saw the installation fail completely or the driver crashing. Therefore nVIDIA's Geforce GTX cards may be the safer choice. Linux delivers the highest performance, thanks to its frequent use on clusters and the extensive optimization work done to make good use of these expensive resources. Windows, being the primary video game platform, has also been well optimized and gets very close to Linux (within a few percent), so the difference is only measurable but not noticeable. MacOS has been heavily optimized for power efficiency and long battery life on mobile devices, but not so much for performance. It has difficulties dealing with programs that spawn multiple threads to fully exploit the CPU's potential. As a result, MD simulations of small proteins may run noticeably slower, but the difference becomes smaller with growing protein size. Unfortunately, GPU acceleration in MacOS is somewhat unreliable, depending on your MacOS version and GPU type, it can work fine or crash. Both problems have been reported to Apple and will hopefully be solved soon.